The early phase of drug discovery is seemingly straight-forward: screen molecules for biological activity, validate screening hits, design and synthesize novel drug molecules for testing in cells and animals. But while drug companies breeze through that process, life scientists working at universities often encounter roadblocks—especially at the last step, unprepared for the challenge of small molecule optimization. At the University of Wisconsin–Madison, however, researchers can leap past that problem, thanks to the School of Pharmacy’s Medicinal Chemistry Center (MCC). That is where the MCC comes in. Since the MCC was established at the School of Pharmacy in 2015, the facility has offered affordable value-added services to biomedical researchers, ranging from drug synthesis and purification to the structural optimization of drug compounds. In two years, the MCC has completed 32 projects for 24 different investigators from 12 different departments on campus, including the Waisman Center and the Departments of Biochemistry, Bacteriology, Chemical Engineering, and more than half a dozen departments from the School of Medicine and Public Health. MCC scientists at the School of Pharmacy also have collaborated on papers, grants, and patent applications, receiving funding for six collaborative grants, filing two patents, and licensing a patent in the time since its formation. Jennifer Golden, assistant professor in the Pharmaceutical Sciences Division and associate director of the MCC, attributes much of that success to the accessibility of medicinal chemistry expertise within the MCC. “One of our unique features is our ability to bridge the gap between biology and chemistry,” she says. “We apply our understanding of drug design to biological concepts, focusing on the attributes of compounds that are important to drug function.” Among those attributes are structural features that help drugs get inside cells, which is fundamental to desirable drug activity. According to Golden, the MCC also has a broad range of specialized equipment necessary for small molecule optimization and purification. With extensive knowledge and the right tools, scientists at the center are able to work efficiently, helping speed the process of drug discovery on campus. Collaboration is central to that process. The MCC connects scientists at the School of Pharmacy with researchers in other departments who are investigating screening hits and want to move forward to animal studies. 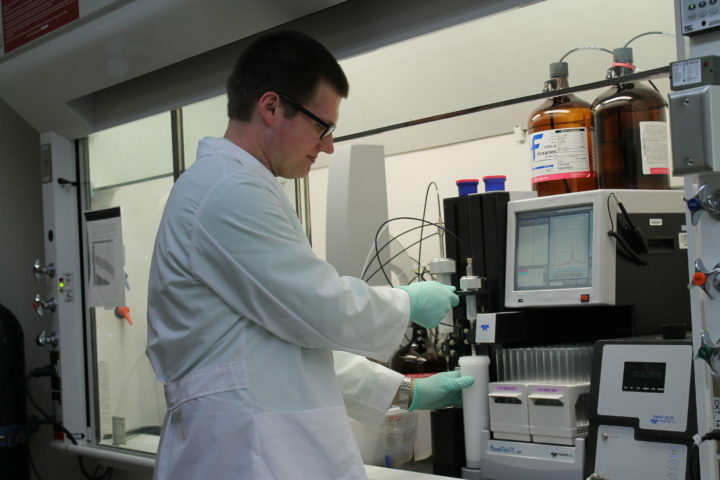 Many researchers on campus use the Small Molecule Screening Facility (SMSF) Shared Resource, provided by the UW Carbone Cancer Center (UWCCC), to identify hits. The SMSF is led by Michael Hoffmann, professor of oncology, who also co-directs the MCC and works to connect the two services. “Often, researchers come to us with compounds that they identified in early-stage drug discovery via small molecule screening,” Tang says. “Our job is to examine and modify the structure of the molecule to optimize structure-activity relationships. Once that work is completed, the optimized molecule is shuffled back to the researcher.” In this way, the MCC fills the gap between screening and other pharmacological studies such as the absorption, distribution, metabolism, excretion, and toxicity of optimized molecules. The MCC’s work has greatly benefited researchers, facilitating the advancement of screening hits to the next level of drug discovery and fostering collaborations between research groups at the School of Pharmacy and those in other departments. A notable example has been the MCC’s role in facilitating the development of a natural product known as diptoindonesin G (Dip G). Wei Xu, professor of oncology in the Carbone Cancer Center, had found that the naturally occurring form of Dip G acted through a novel mechanism to significantly decrease protein levels of a mutant form of the estrogen receptor found in metastatic breast cancer. The amount of Dip G from natural sources, however, was insufficient to carry out animal studies. Overcoming this problem, MCC scientists synthesized one gram of Dip G, which proved to be effective for shrinking tumors in mice. Tang’s research group then collaborated with Xu’s team to develop more potent novel analogues of Dip G, which are protected by a patent filed through the Wisconsin Alumni Research Foundation (WARF). The researchers also developed several new, more efficient synthetic routes for Dip G and its analogues, enabling Xu to move ahead with additional pharmacological studies. MCC is currently using the more efficient routes for large-scale synthesis of Dip G and its analogues. In many cases, the biological significance of the compound structures that are synthesized will only be revealed when screened. Alternatively, a subset of compounds is pharmacologically biased, being built from core elements known to harbor specific bioactivities. Changing the attachments to a common core can lead to significantly different biological action and application. In addition to collaborations on campus, the MCC works with researchers at other universities and companies. 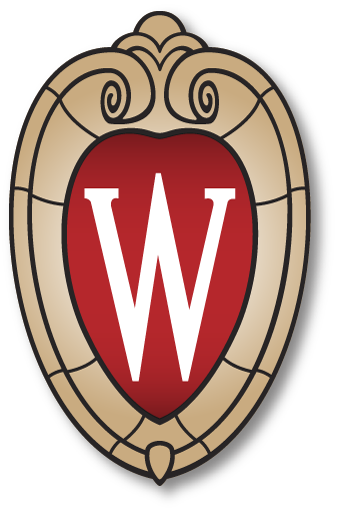 This extension of MCC services serves to strengthen the center’s ties to private sector pharmaceutical and biotech industries, helping the MCC and the School of Pharmacy chart new territory in drug discovery at the University of Wisconsin–Madison. Learn more about working with the Medicinal Chemistry Center.